His natural remedy is no longer seen as very unusual here. While some oncologists abroad say more research is needed to be able to properly back up such a claim, Cuban pharmaceutical firm Labiofam has been using scorpion venom since 2011 to manufacture the homeopathic medicine Vidatox. The remedy has proven popular. Labiofam Business Director Carlos Alberto Delgado told Reuters sales were climbing 10 percent annually. Vidatox already sells in around 15 countries worldwide and is currently in talks with China to sell the remedy there. In Cuba, where tens of thousands of patients have been treated with Vidatox, each vial costs under a dollar. On the black market abroad it can cost hundred times that - retailers on Amazon.com are seen selling them for up to $140. 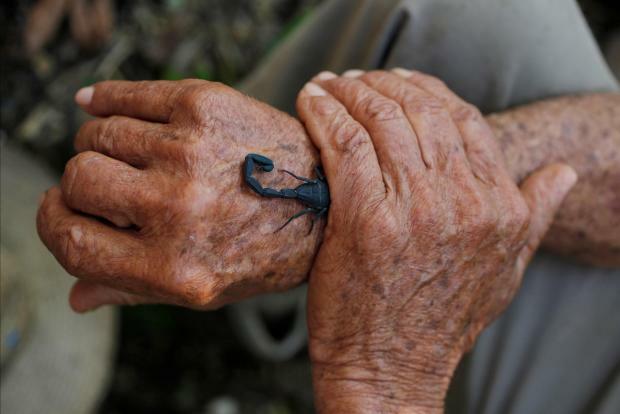 "I put the scorpion where I feel pain," Casanas said while demonstrating his homemade pain relief with a scorpion that he found under a pile of debris on the patch of land he cultivates in Cuba's western province of Pinar del Rio. After squeezing it long enough, it stung him and he winced. "It hurts for a while, but then it calms and goes and I don't have any more pain," he said. Casanas, a leathery-skinned former tobacco farmer who now primarily grows beans for his own consumption, said he sometimes keeps a scorpion under his straw hat like a lucky charm. It likes the shade and humidity, he says, so just curls up and sleeps. In a Labiofam laboratory in the southern Cuban city of Cienfuegos, workers dressed in scrubs and hairnets tend to nearly 6,000 scorpions housed in plastic containers lined up on rows of metal racks. Every few days they feed and water the arachnids that sit on a bed of small stones. Once a month, they apply an 18V electrical jolt to their tails using a handcrafted machine in order to trigger the release of a few drops of venom. The venom is then diluted with distilled water and shaken vigorously, which homeopathic practitioners believe activates its "vital energy." The scorpions are caught in the wild as Labiofam workers believe their venom - which is not dangerous - is not as potent when raised in captivity. After two years of exploitation in the "escorpionario," they are released back into the wild. Dr Fabio Linares, the head of Labiofam's homeopathic medicine laboratory who developed the medicine, said Vidatox stimulates the body's natural defense mechanisms. "After four to five years (of taking it), the doctor whose care I was in told me that my cancer hadn't advanced," said Cuban patient Jose Manuel Alvarez Acosta, who was diagnosed with prostate cancer in 2008. Still, Labiofam recommends Vidatox as a supplemental treatment and says it should not replace conventional ones.